White-tailed deer have become a pest even in urban areas.They eat trees, shrubs, vegetables and other landscape plants grazing on the seedlings, tips, buds, branches, and foliage. Vegetarians, they are frequently found near forest edges. 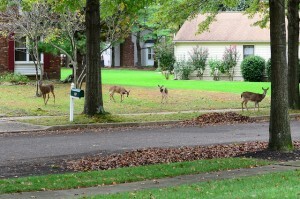 The severity of the damage varies with the deer population and the availability of other food. Scout for deer at dawn, dusk, and nighttime when they are feeding. Plant Selection: Plants with sticky or hairy leaves and stems and foliage with a lemony or minty fragrance are less attractive to deer. 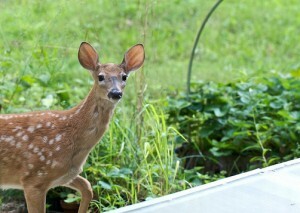 Place these as garden borders to deter deer. 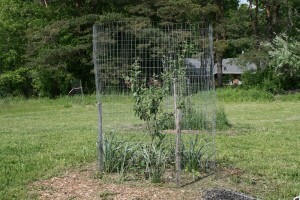 Barriers: Install plastic or woven-wire cylinders around trees and shrubs to fence deer out. Live trapping and removal of deer is not a practical way to control deer damage. Human Hair: No research to validate effectiveness. Pepper Spray: A formulation of 1 to 2 tablespoons of Tabasco sauce in 1 gallon of water sprayed on plants has been shown to have limited effectiveness. Be sure to test a leaf with the spray prior to spraying the plant. See the North Carolina Agricultural Chemicals Manual. Fragrant Soap: Drill a hole in each bar of soap and suspend it with a twist tie or soft twine on the outer branches of trees every 3 feet. 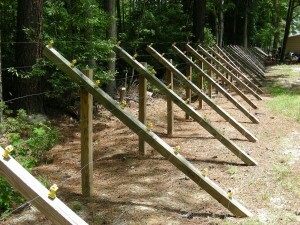 Each bar protects an area of 1 square yard. Replace as needed. Chemical Repellants: Read the label carefully as not all formulations are safe for use on food crops. All chemicals must be applied according to the label’s directions. Effectiveness depends on the weather, the deer’s appetite, and what other food is available. New foliage that appears after treatment is unprotected. Subsequent rain reduces a chemical’s effectiveness and requires retreatment. 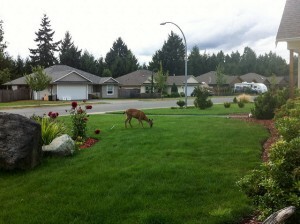 Repellents are most effective if applied before deer become accustomed to foraging on garden plants. Do not use mothballs. The use of mothballs (naphthalene) to manage deer is illegal and potentially dangerous. Small children and pets can be poisoned by eating mothballs. Hunting: Deer are classified as game animals under North Carolina laws and may be hunted during specified deer seasons. See North Carolina Wildlife Resources Commission for regulations.